Everyone knows that beer goes well with pizza and pub food, but wine is a better, more sophisticated match for everything else – especially cheese – right? In fact you couldn’t be more wrong if you were molesting a goat while wearing Crocs. The idea that wine is superior to beer seems to have first come about around 1000 years ago when the Normans (French) conquered England for a spell. During this time they managed to ‘persuade’ everyone that everything French was more refined and appealing, and this misplaced notion is still widely believed – possibly even by you as you read this. Now I’m not arguing that you can’t match wine well with food; there are many classic and wonderful pairings, obvi. Oysters with a dry sauvignon blanc or un-oaked chardonnay. Pinot noir with rabbit and mushrooms. Syrah with some lamb, venison, or other game. I’m a big wine lover myself. (Let’s face it; I’m fond of alcohol in all its forms). But the fact of the matter is that while both beverages are complex, beer simply has a much wider variety of flavors than wine. This is because it has four main ingredients (a malted grain such as barley, wheat, rice, or rye; plus water, yeast, and hops) and you can also add almost any other ingredient: from chocolate to bacon, to fruit, flowers, honey, coffee, herbs, chili peppers and almost anything else you can think of. The charismatic head brewer of Delaware’s Dogfish Head brewery, Sam Calagione, is famous for experimentation with ingredients in his beers. Compare this with wine, which features only one ingredient: grapes. There isn’t nearly as much difference between a pinot gris and even a merlot as there is between a wheat beer and a stout, or a saison and a brown ale. Because of this narrower flavor profile it’s rare that wine can complement, as opposed to merely contrast, with the flavors and textures of food – particularly cheese – while beer’s broader flavor palette is versatile enough to both complement and contrast. 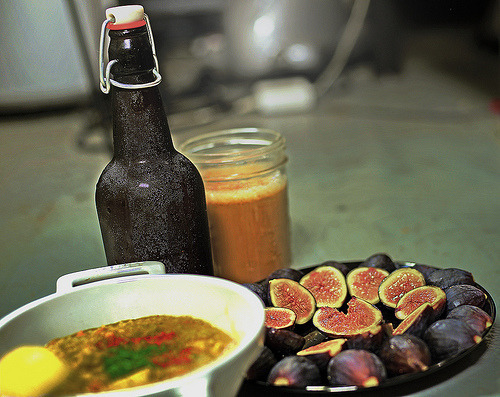 At this point I’d like to introduce you to someone you really do want to know more about if you’re interested in the possibilities of craft beer, and especially of matching it with food. Brooklyn Brewery brewmaster Garrett Oliver has served as a competition judge for the Great American Beer Festival for twenty years, is editor-in-chief of The Oxford Companion to Beer, author of The Brewmaster’s Table, and one of the world’s foremost authorities on beer. Oliver frequently partakes in competition with top wine sommeliers both in New York and around the world to see who can come up with the best beverage match for a series of dishes – and has never been beaten once. He’s the Terminator of food pairings. I’ll leave you with a couple of my favorite beers and some suggestions to try matching with them. 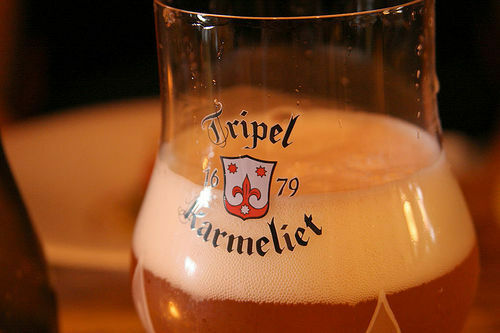 I’m quite partial to an Abbey tripel, also known as a Strong Golden Ale, and two of my favorite examples that have fairly good availability are Belgium’s Tripel Karmeliet and Victory Brewing from Pennsylvania’s Golden Monkey. This style of beer is high alcohol and has a complex, fruity, yeasty flavor profile, often with floral, bubblegum and banana notes, but a dry finish. Try one of these tripels with dishes that feature basil, such as a pesto, a Thai chicken stir-fry or beef salad (not too hot, as the high alcohol will bring out the heat), shellfish – crabcakes! – a Thanksgiving turkey, a margarita pizza, or a ham ‘n cheese (Mmm, croque monsieur…). In terms of cheese you could try a triple cream such as St. Andre or Explorateur, and with dessert it’s probably best to stay away from chocolate. Instead go for something that features apricots or peaches, baklava, a nutty dessert like pecan pie (bring on Thanksgiving! ), or blow your mind by pairing caramelized orange cheesecake with Tripel Karmeliet – the flavors will sing an angel’s choir of harmonious symphony in your mouth. Find more Tripel pairing suggestions here.